Celebrate science and stimulate your child's imagination by bringing the wonder of the universe to your little one's room with set of space-themed alphabet prints. 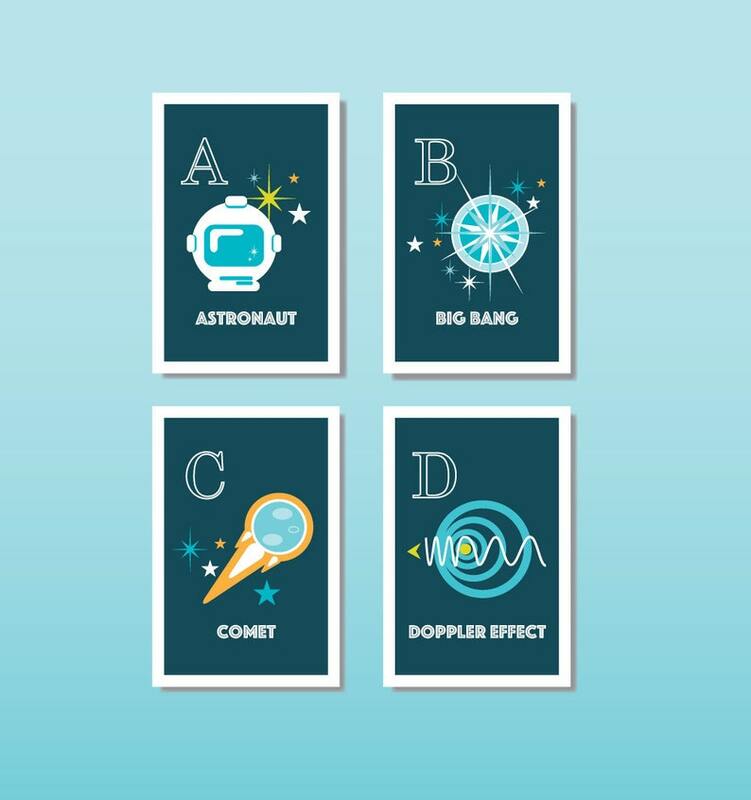 Each letter of the alphabet is represented by a scientific term, ranging from simple (S=Stars) to complex (D=Doppler Effect), and a unique illustration that is sure to add an out-of-this-world element to your little scientist's room. This vibrant set of 4x6s is professionally printed on glossy card stock, making them perfect for framing or simply hanging on your wall. Check out my shop for other stellar designs and unique ways to celebrate science with your child. © 2015 Amy Summers. All rights reserved. All designs are intended for personal use only. No commercial use, reproduction, or resale is permitted. Great quality print and thickness. I think this will be a great addition to our son's nursery. Shipped promptly and looks great! I accept direct checkout and Etsy gift cards. My goal is to deliver high-quality design with great customer service. I work hard to ensure that my shipping process supports the high quality standards I have for my products, but if for some reason an item is damaged during shipping I will issue a refund or resend a new product. Please message me if you've received a damaged item, provide a photograph of the damage and let me know if you'd prefer a refund or a new item. If you are not satisfied with the product for a reason other than shipping damages, please message me so we can work out any issues. Refunds will only be issued for damaged items, but I will work with you to resolve other issues to ensure your satisfaction. Due to the nature of the product, digital downloaded items are not eligible for refunds. However, your satisfaction is extremely important to me so if for some reason there is any issue with downloaded files, please send me a message and I'll do everything I can to work it out! Physical items are shipped with product quality and care in mind. I take measures to ensure damage-free delivery and aim to have my shipping process meet the same high quality standards I have for my products. (See refund policy below for those unfortunate exceptions). Shipping times vary, but as soon as I receive your order I'll send you a message to confirm the purchase. Once the order is ready to ship, I'll send you a message with the estimated delivery date along with tracking info for the order (when available).